More pink! I just could not picture this doily stencil done any other way, and I also found this distress embossing powder that I wanted to use. It is very old so I am surprised it was still good. I did the stencilling on a piece of vellum using 4 ink colours. I made the frame and sentiment banner by using my large deckle rectangle die. The panel is attached to my card base using foam tape. I heat embossed the love sentiment then die cut it along with die cutting the shadow in white, and stamped the wording using black ink. When I was attaching the love I realised it would push in the vellum, so with tweezers I stuck in another piece of foam tape that sits underneath the die supporting it. I finished by adding a few sequins. 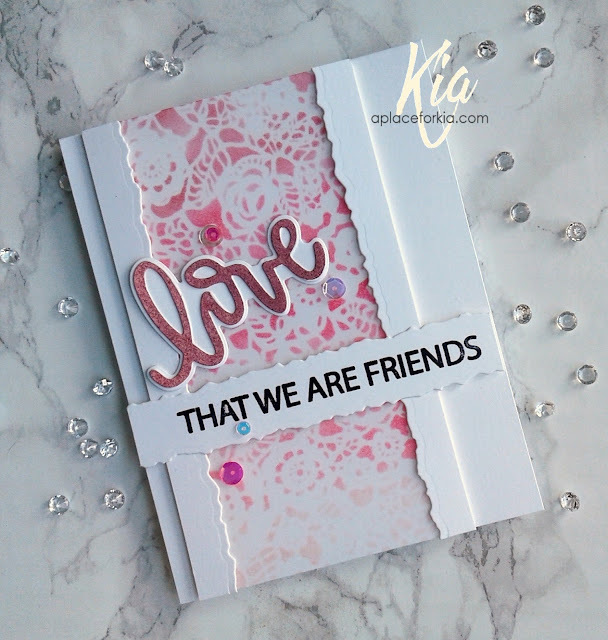 Products: Neat and Tangled Love Notes Stamp and Die Set, Spellbinders Large Deckle Rectangle, Tim Holtz Doily Stencil, Tim Holtz Distress Embossing Powder, VersaMark Embossing Ink, Neenah Cardstock, Vellum, Altenew Ink Frosty Pink, Coral Berry, Ruby Red, Grapevine, Ranger Archival Black Ink, Sequins, Foam Tape. Beautiful! Love the stenciling on vellum.